The 24-Hour Mommy: Count the rubber duckies and win Lactacyd Baby Bath gift packs! 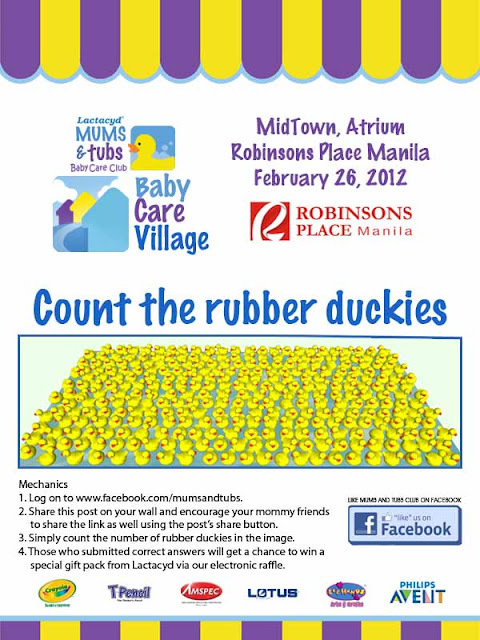 Count the rubber duckies and win Lactacyd Baby Bath gift packs! Share this post on your wall and encourage your mommy friends to share the link as well using the post's share button. Simply count the number of rubber duckies in the image. Those who submitted correct answers will get a chance to win a special giftt pack from Lactacyd via an electronic raffle draw. This is the second year that The 24-Hour Mommy has been tagged as Lactacyd Baby Bath Baby Care Village. Watch out for more promos from Lactacyd Baby Bath and the Mums and Tubs Baby Care Club through this blog! oooh....rubber duckies. Tiki loves her duckies! exciting to know that mums and tubs have new activities for moms once again! Hi! Please log on to the Mums and Tubs Facebook page and post your answer there to be counted.